On the opening day of Google Developer Day, Google announced an automated testing solution developed by NetEase - Airtest Project. AirtestIDE is a cross-platform UI test automation IDE for apps and games. AirtestIDE currently supports testing of Android and Windows applications, and support for iOS is coming soon. NetEase has been using this technology to test several of its flagship games including Fantasy Westward Journey, A Chinese Odyssey, Onmyoji, Knives Out, and Terminator 2: Judgment Day. AirtestIDE uses the Airtest framework. Airtest framework is based on image recognition technology to locate UI elements. It means that it is possible to automate the tests for games without injecting any additional code. Users can simply interact with their phones in the AirtestIDE device window to automatically generate Python code directly into their scripts. AirtestIDE also integrates the POCO framework. POCO framework is based on UI hierarchy inspection and, by default, it supports mainstream game engines such as Unity3d, Cocos2d, and native Android apps as well. 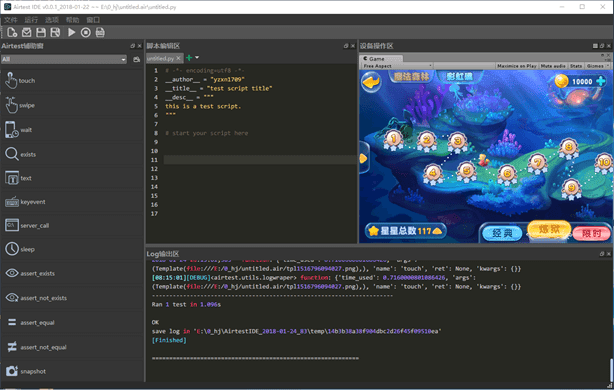 It also provides an extensible SDK to support any other game engines. During the testing, AirtestIDE can help testers to quickly locate the failed test cases, to re-play the test operations step by step and it also provides an HTML report of the test results. AirtestIDE allows for much faster test-diagnose-fix cycles than ever before. Furthermore, the code generated by AirtestIDE is based on the Python 2.7 programming language.These things make it easier for beginners to get started, and they also help experienced developers improve their scripts by adding third-party libraries and tools. This set of tools can generate tests which can be run as part of a continuous integration system. These continuous tests would run either on local devices or in the cloud on Firebase Test Lab. In practice, the game and app developers often need to test their app’s or game's compatibility across hundreds of different Android phones. AirtestIDE now allows developers to simply write a test scenario and run it on each Android phone. The Airtest project approach vastly reduces the amount of manual testing, allowing you to complete your testing in time for launch. Google announced its partnership with NetEase at this year’s Games Developer Conference (GDC) in San Francisco. Google integrated the Airtest technology into the Firebase Test Lab to help improve the Android development ecosystem and AirtestIDE plays an important role here by providing this automated game testing solution. "AirTest is one of the most powerful and comprehensive automated testing solution for developing Android games. We are very glad that Netease open-sourced the project to make it available for worldwide mobile developer community. It was also a pleasure to work with talented engineers at Netease to make AirTest part of Firebase Test Lab's game testing solution." said Justin Broughton, Lead Engineer of Google Firebase Test Lab. NetEase and Google have discussed further cooperation to use the machine learning in the game development and testing. Last but not least, Google Engineers will be giving a speech about the Airtest Project on March 21 (PST). Technical director Liu Xin from NetEase Games has been invited to give a live demonstration of the project. During GDC, developers will be able to visit the Google booth to meet with NetEase's QA team.